After more than two weeks since elections were held, Honduras still does not have an officially recognized president-elect. In this piece, I discuss the election and its aftermath, focusing on the energy of resilience and resistance among Honduran youth and the protest and repression that has erupted since the election. I highlight how the highways and toll booths are important sites of tension and destruction. I am conducting doctoral fieldwork in Honduras, focusing on the experiences of deportees in and around the Sula Valley yet the unexpected election and its aftermath has taken center stage. “The only thing Juan Orlando offers us is the pozo,” Irvin Daniel [i] tells me. Pozo – literally meaning “well” [ii] – refers to newly constructed supermax-style prisons in Honduras. A week after Honduras’ currently contested elections, Irvin Daniel explains why people are fervently opposed to the re-election of the current president, Juan Orlando Hernandez (colloquially known as JOH). At 24 years-old, Irvin Daniel describes life as a daily struggle. He lives in Villanueva, on the outskirts of San Pedro Sula, where his family built a make-shift home along land that was once a railway. Irvin has been deported from Mexico twice. He is trying to finish high school and is constantly looking for work. His uncle and two cousins were murdered last year, one of them after having an asylum claimed denied and being deported from the United States. As Irvin and others see it, Orlando’s past four years in power have only made life harder for young people living on the margins. San Pedro Sula, Cortés. Monday, November 27th. The graffiti reads “Worker, Peasant, and Popular Government.” Photo credits: Author. At 4pm on November 26th, the Honduran election polls closed. Yet late that night, there were still no results. This was unusual: typically, by 11:00pm the votes are tallied and the winner declared. With about 50% of the vote reported, Salvador Nasralla, of the primary opposition party known as the Alianza, was ahead by 5 percentage points. Statistically, this seemed to assure an Alianza victory. However, late that same night Orlando declared himself the winner. The body in charge of counting the votes, the Supreme Electoral Tribunal (TSE), notably is led by Orlando-appointees. The TSE continued to postpone announcing an official count, citing differing and often unusual reasons. At one point, the TSE announced the electoral technology crashed and had to be re-initiated. Then the TSE claimed that many of the votes from areas where the Alianza dominates had irregularities that required additional scrutiny. Improbably, in the following week, the TSE released new preliminary information stating that Orlando was ahead by 1.5% with the final count still pending. Today, two weeks after Hondurans voted, there is still not an official result. While the declaration from the TSE is still pending, their judgement appears increasingly irrelevant. The constant stalling and confusion only adds to the popular sentiment that Juan Orlando and his ruling National party are committing fraud to maintain the presidency. Rio Blanco, San Pedro Sula, Cortés. Friday, December 1. Photo credits: Author. La Lima, Cortés. Thursday, November 30th. Military amassing at the San Pedro Sula airport. Photo credits: Author. San Pedro Sula, Cortés. Sunday, December 3rd. Military and police stand ready while a peaceful protest is underway. Protestors gave white flowers to the police officers. Photo credits: Author. La Lima, Cortés. Friday, December 1st. Military convoy marching toward protestors. Photo credits: Author. San Pedro Sula, Cortés. Sunday, December 3rd. Young people with signs that read (left to right) “JOH you are not my president”; “JOH you are leaving (with music notes to reference the popular song)”; “wanted for destroying a country”; and “Honduras bleeds because of fraud. Get out JOH.” Photo credits: Author. San Pedro Sula, Cortés. Sunday, December 3rd. Photo credits: Author. San Pedro Sula, Cortés. Sunday December 3rd. Two protestors stand on the pedestal where a monument to the founder of the National Party once stood in San Pedro Sula’s central park. Photo credits: Author. In the United States, an 8-year presidency is common, yet in Honduras the constitution expressly forbids re-election. The coup against Zelaya Rosales was carried out precisely because he planned to hold a referendum to gauge interest in changing the constitution to allow for re-election. Orlando has not gone that route. Rather, he changed the make-up of the country’s top courts, which decided that prohibiting re-election violates an individual’s rights. This opened the door for Orlando to run for re-election, even though the constitution remains unchanged. Regardless of the legal rulings, the idea that the same person could continue as president does not sit well with much of the Honduran citizenry, which has been under military rule almost as frequently as civilian rule. People regularly liken re-election to dictatorship. In Sector Lopez Arellano, the most populous neighborhood of Honduras’s third largest city, Choloma, the residents have been organizing in preparation for this moment ever since the 2009 coup. Carlos, one of the organizers in La Lopez, says that they are ready to stand up to whatever repression comes. I asked youth manning the highway blockade from Carlos’s area what they will do if Juan Orlando is declared the winner. They say that it means ‘war.’ A teenager with a t-shirt covering most of his face tells me that they are ready to take up arms if necessary. They will not accept four more years of the same repression, marginalization, and violence. Sector Lopez Arellano, Choloma, Cortés. Friday, December 1st. 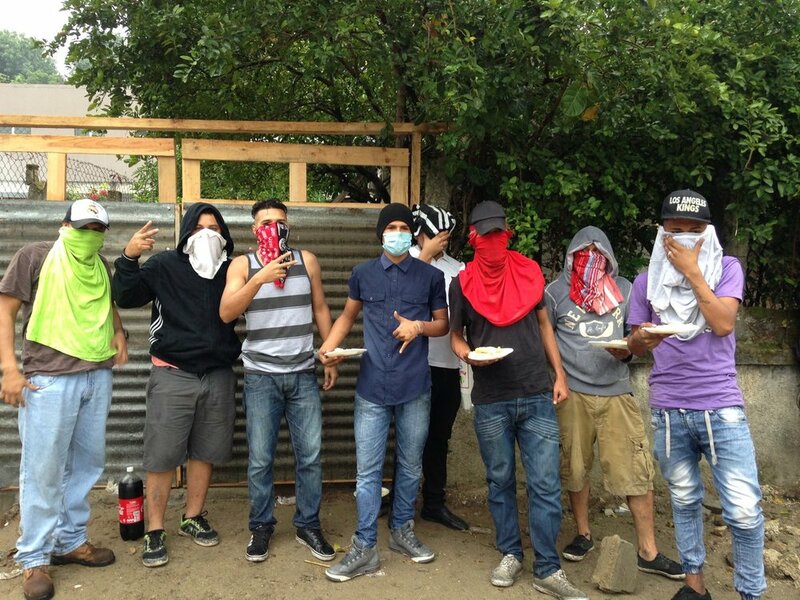 The team under Carlos’s leadership in charge of the highway blockade in their neighborhood. Photo credits: Author. The violence in La Lopez is noteworthy. Some sectors of society have lauded Juan Orlando for ushering in significant declines in the country’s homicide rate [vi]—but these gains in security are experienced unevenly. In neighborhoods like La Lopez, murders have remained frequent, while other kinds of violence and insecurity abound. Choloma has actually seen an increase in homicides in the last year. While the military now patrols to enforce the curfew across the country, in neighborhoods like La Lopez the presence of militarized authorities is longstanding. In the poor, urban neighborhoods of Honduras’s cities, the Military Police (a new force inaugurated under Juan Orlando) are a common presence. And the repression they represent – especially for poor, young men – is nothing new. The night before I visited Carlos and his team, the military dispersed a protest on the highway. To do so, the military fired gas canisters and live rounds at the crowd to clear the street. When protestors retreated to their neighborhood, the authorities followed, shooting at them even as they took cover in their homes. The boys pointed out the marks of bullets; I picked up a spent casing. Sector Lopez Arellano, Choloma, Cortés. Friday, December 1st. Two members of the team manning the road block. One holds up the spent shell I found on the ground. Photo credits: Author. Sector Lopez Arellano, Choloma, Cortés. Friday, December 1st. Evidence of where a bullet struck a chain at the entrance to the neighborhood. Photo credits: Author. 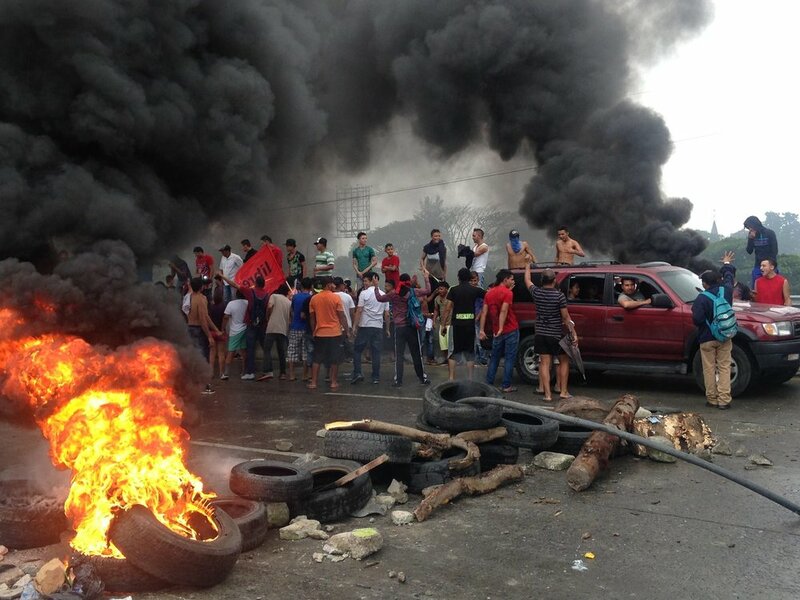 The same day that the military shot at unarmed teenagers running home in La Lopez, other protestors burnt down the toll booth on the way to Villanueva on the other side of the Sula Valley. Indeed, all of the toll booths across the Valley have been left inoperable by protestors. So far, none of them have resumed function. Highway from San Pedro Sula to Villanueva, Cortés. Thursday, November 30th. Protest and toll booth burning. Photo credits: Author. Highway from San Pedro Sula, to Choloma, Cortés. Friday, December 1st. Burnt and abandoned toll booths. Photo credits: Author. 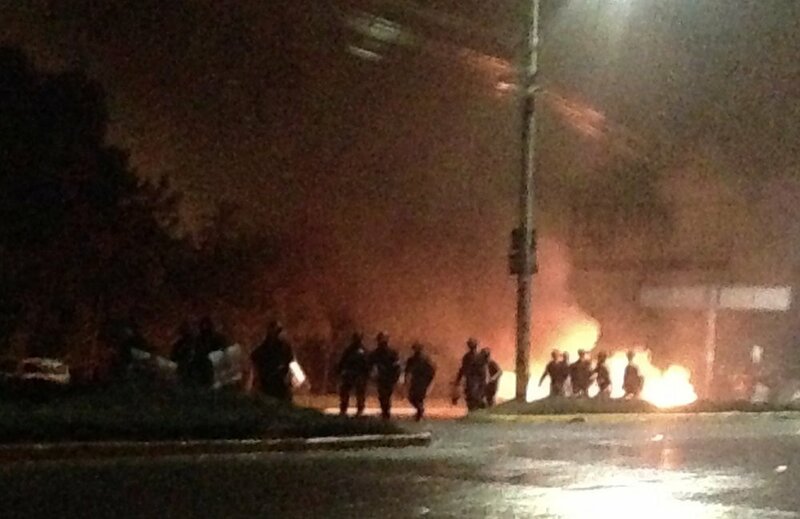 This is largely symbolic: toll booths (or peajes in Honduras) are a flashpoint for unrest. They represent a particular kind of extractive business model that the National Party has championed since assuming power after Zelaya Rosales' ouster. In an effort to attract private investment, much of the country’s resources have been concessioned to private, often foreign, companies. Funds from many of the tolls go directly to private companies, not to the state or the populace. In return, the company is supposed to maintain the highway, but that part of the bargain is not always fulfilled. Meanwhile, the tolls are exorbitant for the majority of the people who live on poverty wages. In addition, intractable traffic jams on the 4-lane highways have become commonplace as cars slow down to pass through the toll booths. Burning down the toll plazas, then, is an act of symbolic resistance which reclaims freedom of movement from the state and its privatization policies. Leading up to the election, nearly everyone I spoke with was supporting the Alianza with only two exceptions—two individuals who were employed by the government. Yet even as people expressed their preference for the Alianza, they also declared with conviction that they expected the National Party to commit fraud to maintain power. In spite of this cynicism, people still turned out to vote in massive numbers – including young people like Irvin Daniel and the boys from La Lopez. All around the Sula Valley, I often hear random shouts of “Fuera JOH!” (“JOH get out!”). Under curfew, people blare what has now become the de facto anthem “JOH, es para fuera que vas” [vii] from their windows. People spill out of their houses, banging pots and pans to the rhythm of the song and defying the curfew and the National Party government all at once. San Pedro Sula, Cortés. In this corner store, the bell is broken. Yell “GET OUT JOH” and we will serve you!!!! Photo credits: unknown. The question now, though, is what happens when a president is officially declared. If the TSE names Juan Orlando Hernandez as victorious – an act which seems increasingly likely – the protests that began with young people blocking highways and burning down toll booths will likely grow. What that will become – and how the state will respond – remains to be seen. [i] This and all names used in this essay are pseudonyms. [ii] Well: as in a deep, dark hole in the ground. [iii] After four days, the curfew started to be rolled back, little by little, especially after Amnesty International issues a report condemning the suspension of human rights. It was extended to 8pm, then 10pm, then lifted for parts of the country altogether. [iv] After 4 nights of the curfew, one segment of the police, the Cobra Battalion, went on a one-day strike, stating that they were apolitical and would not be used as tools of repression. This was a remarkable move, but limited in its impact. [v] University students are also playing an important role in the current protests. A short while ago, they were at the forefront of a movement looking to preserve fair public education at the university level. They went on strike and succeeded in getting the chancellor of the National Autonomous University to step down. They suffered intense repression during their protests which, many people say, prepared them to survive whatever repression might come in this post-elections moment. [vi] There is also skepticism as to whether the statistics reported during Orlando’s tenure are wholly accurate. For example, a change to the way that murder statistics are kept – requiring autopsies and a coroner’s report – may significantly undercount murders in a country where only three cities have a coroner’s office and where tradition requires swift burial of bodies. [vii] The translation is essentially, JOH you’re on your way out. Amelia Frank-Vitale is a doctoral student in anthropology at the University of Michigan. Después de más que dos semanas de las elecciones, Honduras aún no tiene un presidente electo oficialmente reconocido. En este texto, se habla de las elecciones y sus secuelas, enfocándose en la energía de resiliencia y resistencia de los jóvenes hondureños y las protestas y represiones que han surgido desde las elecciones. Se subraya cómo las carreteras y casetas de cobro son sitios importantes de tensión y destrucción. La autora actualmente está haciendo trabajo de campo para su doctorado en Honduras, enfocada en las experiencias de las personas deportadas en el valle de Sula, pero los resultados inesperados de las elecciones y sus secuelas han tomado, momentáneamente, el centro del escenario. «La única cosa que nos ofrece Juan Orlando es El Pozo», me dice Irvin Daniel [i]. Por El Pozo se refiere a las nuevas cárceles —estilo «supermax»— que han construido en Honduras. Una semana después de las elecciones, Irvin Daniel me explica por qué tanta gente está tan en contra de la reelección del presidente actual Juan Orlando Hernández (conocido como JOH). A sus 24 años, Irvin Daniel habla de su vida como una lucha diaria. Vive en Villanueva, en las afueras de San Pedro Sula, donde su familia ha construido una casa sobre tierra que antes se ubicaba en las vías ferroviarias. Irvin ha sido deportado dos veces de México. Está intentando terminar la secundaria y busca trabajo constantemente. En el último año asesinaron a su tío y a dos primos, uno de ellos después de haber pedido asilo en Estados Unidos y haber sido deportado a Honduras. Como lo ve Irvin y mucha otra gente los últimos cuatro años de Orlando sólo han hecho la vida más dura para la gente joven que viven en las zonas marginadas. San Pedro Sula, Cortés. Lunes, 27 de noviembre. Foto crédito: autora. A las cuatro de la tarde del día 26 de noviembre cerraron las mesas de votaciones en Honduras. Sin embargo, por la noche, no había aún resultados. Esto fue doblemente inusual: por una parte, es la primera vez que cierran los centros de votación tan temprano, y por otra, normalmente, ya para las 11 de la noche los votos han sido contados declarándose al ganador. Con más o menos 50% del voto reportado, Salvador Nasralla, del partido de oposición, conocido como la Alianza de Oposición (integrado por varios partidos políticos) iba ganando por 5 puntos porcentuales. Estadísticamente, parecía asegurarse el gane de la Alianza. Sin embargo, esta misma noche, Juan Orlando se auto declara como ganador. Cabe mencionar que el instituto encargado del conteo de votos, el Tribunal Supremo Electoral (TSE), está conformado por personas —afines— puestas por Orlando. El TSE continúa posponiendo un anuncio final oficial, citando variadas y muchas veces raras razones. En algún momento, el TSE anuncia que la tecnología electoral (el sistema) se cayó y tuvieron que reiniciarla. Después el TSE dijo que muchos de los votos de las zonas donde domina la Alianza tenía irregularidades y se requería un escrutinio aparte. Improbable y dudosamente, en la semana siguiente, el TSE dio nueva información preliminar indicando que ahora Orlando iba ganando por 1.5%, con el conteo final pendiente. Hoy, dos semanas después de cuando los hondureños votaron, siguen sin tener un resultado oficial. Mientras la declaración del TSE sigue pendiente, su divulgación y aprobación parece cada vez menos relevante. El hecho de haber estado posponiendo durante tanto tiempo los resultados se ha generado mucha confusión que no ha servido sino para aumentar el sentimiento de indignación popular a razón de que Orlando y el Partido Nacional —partido gobernante— están cometiendo fraude para mantenerse en la presidencia. Rio Blanco, San Pedro Sula, Cortés. Viernes, 1 de diciembre. Foto crédito: autora. La Lima, Cortés. Jueves, 30 de noviembre. 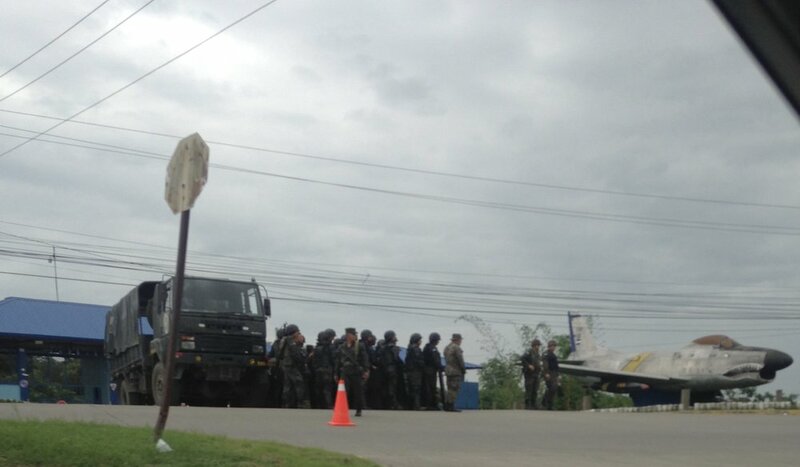 Militares amasando en el aeropuerto de San Pedro Sula. Foto crédito: autora. San Pedro Sula, Cortés. Domingo, 3 de diciembre. 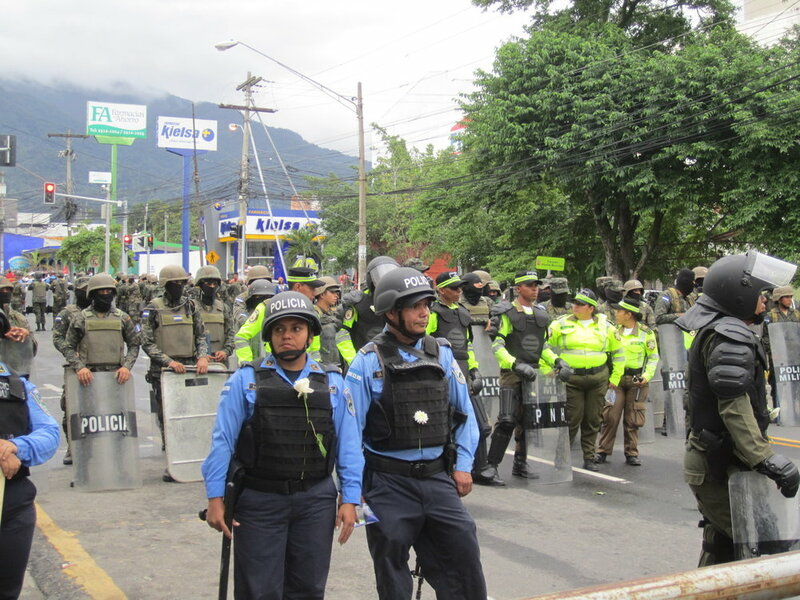 Militares y policías listos mientras una manifestación pacifica se realiza. Los manifestantes repartan flores a los policías. Foto crédito: autora. La Lima, Cortés. Viernes, 1 de diciembre. Militares marchando hacía manifestantes. Foto crédito: autora. San Pedro Sula, Cortés. Domingo, 3 de diciembre. Foto crédito: autora. San Pedro Sula, Cortés. Domingo, 3 de diciembre. Dos manifestantes se paran en el pedestal donde antes hubo un monumento al fundador del Partido Nacional. Foto crédito: autora. En los Estados Unidos una presidencia de ocho años es común, pero en Honduras la Constitución prohíbe claramente la reelección. El golpe en contra de Zelaya fue justificado precisamente porque él estaba planeando hacer un referéndum para medir el interés del pueblo en cambiar la constitución para permitir la reelección. Orlando no ha ido por este camino; en su lugar, cambió los jueces de la Corte Suprema de Justicia del país, haciendo injerencia en otro poder del Estado. Como consecuencia, los nuevos jueces decidieron que al prohibir la reelección se violan los derechos humanos de un individuo: así se abrió camino para que Orlando pudiera volver a ser candidato para la presidencia, aunque la constitución en sí sigue sin cambiarse y prohibiendo la relección. Sin importar lo legal, la idea que una sola persona pueda continuar como presidente más de un periodo no le parece bien a una gran parte de la ciudadanía hondureña, quien, históricamente, ha vivido debajo de regímenes militares casi igual de frecuente como regímenes civiles. Con frecuencia se habla de la reelección como dictadura. En el Sector de la López Arellano, la región más poblada de la tercera ciudad más grande de Honduras, Choloma, los residentes se han estado organizando para este momento desde el golpe de 2009. Carlos, uno de los organizadores de La López, dice que están listos para resistir cualquiera represión que esté por venir. Pregunté a unos jóvenes que estaban cuidando el bloqueo de la carretera en frente de la zona de Carlos, ¿qué es lo que harían si se declara Orlando como ganador? Me respondieron que eso implicaría guerra. Un adolescente con una camiseta cubriendo la mayor parte de su cara me dice que están listos para levantarse en armas de ser necesario. No aceptarán cuatro años más de la misma represión, marginalización y violencia. Sector López Arellano, Choloma, Cortés. Viernes, 1de diciembre. EL equipo bajo el liderazgo de Carlos que está encargado del bloqueo en su barrio. Foto crédito: autora. La violencia en La López es notable. Algunas partes de la sociedad han alabado a Orlando por haber iniciado una disminución significante en la tasa de homicidios del país [v], pero estos avances en la seguridad se han experimentado de una manera desigual. En barrios como La López, los homicidios siguen siendo frecuentes, mientras otras formas de violencia e inseguridad acontecen. Choloma ha visto un incremento de homicidios en el año pasado. Mientras los militares patrullan actualmente para reforzar el toque de queda por todo el país, en barrios como La López la presencia de autoridades militarizadas tiene una larga historia. En las zonas urbanas y pobres de las ciudades del país, la Policía Militar (PMOP, una nueva fuerza iniciada por Orlando) es una presencia común. Y la represión que representa —especialmente para hombres jóvenes y pobres— no es nada nuevo. La noche antes de cuando visité a Carlos y su equipo los militares dispersaron una protesta en la carretera. Para hacerlo, los militares lanzaron gas lacrimógeno y dispararon balas a la gente para vaciar la calle. Cuando los manifestantes regresaron a su barrio, las autoridades los persiguieron, tirando todavía mientras los manifestantes buscaban refugio dentro de sus casas. Los chavos me muestran los huecos que dejaron las balas. Encuentro y recojo el casquillo de una bala. Sector López Arellano, Choloma, Cortés. Viernes, 1 de diciembre. Dos miembros del equipo del bloqueo. Uno presenta el casquillo de la bala que se encontró en el suelo. Foto crédito: autora. Sector López Arellano, Choloma, Cortés. Viernes, 1 de diciembre. 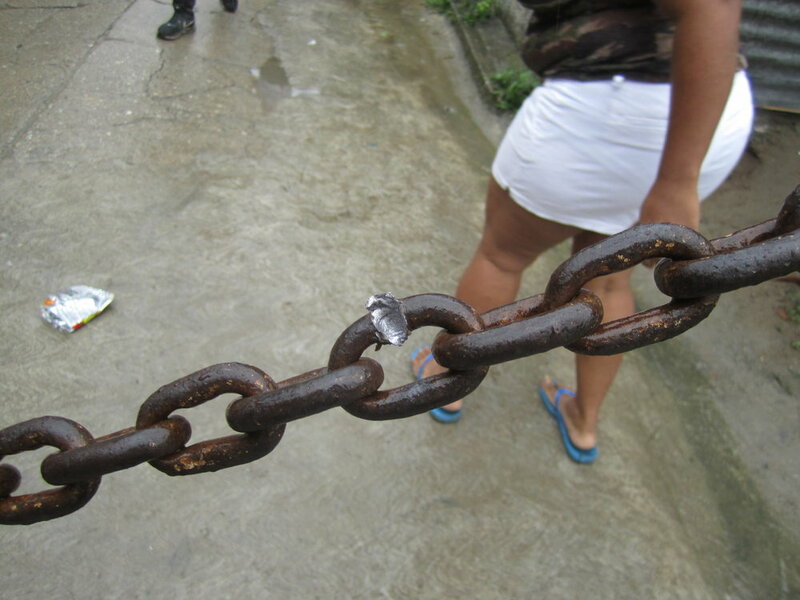 La evidencia de donde una bala pegó una cadena en la entrada del barrio. Foto crédito: autora. El mismo día, en La López, cuando militares dispararon a adolescentes no armados que corrían para sus casas, otros manifestantes quemaron la caseta de cobro de peaje camino a Villanueva, en el lado sur del valle de Sula. Vale resaltar que los manifestantes han dejado inoperables todas las casetas de peaje a través del valle. Hasta la fecha ni una ha vuelto a funcionar. Carretera de San Pedro Sula a Villanueva, Cortés. Jueves, 30 de noviembre. Manifestación y la caseta de cobro en llamas. Foto crédito: autora. Carretera de San Pedro Sula a Choloma, Cortés. Viernes, 1 de diciembre. Friday, Caseta de cobro quemada e abandonada. Foto crédito: autora. Esto tiene su componente simbólico: las casetas de cobro (peajes en Honduras) son un foco para el desasosiego. Representan un modelo particular de negocio extractivo que se ha apoyado por el Partido Nacional desde que llegaron al poder después del desahucio de Zelaya. En un intento para atraer inversión privada, una gran parte de los recursos del país ha sido concesionada a compañías privadas —muchas veces extranjeras—. Los fondos de varias de las casetas de cobro van directamente a compañías privadas, ni al estado ni al pueblo. A cambio, se supone que la compañía debe preservar en buenas condiciones la carretera, pero esta parte del trato no siempre se cumple. Además, el cobro es exagerado para la mayoría de la población que vive en pobreza. También, el tráfico se amontona de una manera insoportable mientras por los cuatro carriles se baja la velocidad para que los vehículos pasen por las casetas. La quema de las casetas, entonces, es un acto de resistencia simbólica cuyo reclamo es al estado y a sus políticas de privatización exigiendo la libertad de circulación. En las semanas antes de las elecciones, casi todas las personas con quien hablaba apoyaban a la Alianza, con solo dos excepciones: dos individuos empleados por el gobierno. Pero mientras la gente manifestaba su preferencia para la Alianza, estos declaraban, a su vez, su convicción de que el Partido Nacional iba a cometer fraude para mantenerse en el poder. A pesar de este cinismo manifiesto, la población salió a votar en números muy altos, incluyendo gente joven como Irvin Daniel y los muchachos de La López. Moviéndome por el valle de Sula, se escuchan con frecuencia gritos de «¡Fuera JOH!». Bajo «toque de queda», por sus ventanas, la gente pone en alto volumen la canción que se ha convertido en un himno: “JOH, es para fuera que vas.” A modo de protesta, las personas salen de sus casas pegando a sartenes y ollas al ritmo de la canción, desafiando el «toque de queda» y a la vez al gobierno del Partido Nacional. San Pedro Sula, Cortés. Foto crédito: desconocido. La pregunta ahora es qué es lo que va a pasar cuando se declare de manera oficial al nuevo presidente. Si el TSE nombra a Juan Orlando Hernández como el ganador —lo que parece cada vez más probable— las manifestaciones que empezaron con jóvenes bloqueando carreteras y quemando las casetas de cobro probablemente crecerán. En qué se convertirá y qué sucederá, y cómo responderá el estado, queda aún sin saberse. [i] Este nombre y todos los nombres usados en este ensayo son pseudónimos. [ii] Después de cuatro días, el horario del «toque de queda» fue reduciéndose, poco a poco, especialmente después de un reporte de Amnistía Internacional que condenó la suspensión de los derechos humanos. Si antes el horario comprendía 12 horas, de 6 de la tarde a 6 de la mañana, este pasó a las 8 de la noche, luego a las 10 de la noche, siendo, finalmente, suspendido completamente. [iii] Después de cuatro noches del «toque de queda», un batallón de los policías, los Cobras (Fuerzas especiales de la Policía Nacional) iniciaron una huelga de un día, adjudicándose su papel apolítico y que no querían ser usados como herramientas de represión por medio del gobierno. Fue una cosa fuerte e inesperada, pero limitada en su impacto. [iv] También los jóvenes universitarios están jugando un papel importante en las manifestaciones actuales. Hace poco ellos encabezaron un movimiento fuerte que buscaba justicia en la educación universitaria pública, haciendo huelgas y logrando ver la destitución de la rectora de la Universidad Nacional Autónoma de Honduras. Ellos sufrieron alta represión en su lucha, la cual, dicen varios, los ha preparado bien para aguantar cualquiera represión que viene en estos momentos pos-electorales. [v] Hay cierta duda si las estadísticas que se reportan durante el tiempo de Orlando son completamente precisas. Por ejemplo, un cambio en la manera por la cual se mantiene las cifras de homicidios —requiriendo una autopsia y un reporte de Dirección General de Medicina Forense— podrían sub-contar (omitir) homicidios en un país donde solo hay tres ciudades que cuentan con una oficina Forense y donde la tradición requiere un entierro de los restos de los cuerpos con la mayor prontitud. Amelia Frank-Vitale es un estudiante de posgrado haciendo su doctorado en antropología social en la Universidad de Michigan. Agradece a Gustavo Campos, poeta y escritor hondureño, por su colaboración en redactar la versión de este texto en español.